People that share common interests and goals make up a community. Here in Taos our community attracts people that like to be surrounded by art, beauty, and uniqueness. The conununity of Taos works together to ensure that kids get a good education, have a safe environment, and friendly neighborhoods. Our teachers and parents encourage us to do well and when we make the honor roll we are taken to the movie theater. Community members will all work together to help each other out in crisis situations. For example, when my sister was going through surgery people donated gifts to help raise money for the bill. Our parents can allow us to go bike riding or play at the park because they know that someone out there will look out after us. There are many differences that exist in our community as well in the world. A few of the differences that exist in our community include art, culture, and social groups. 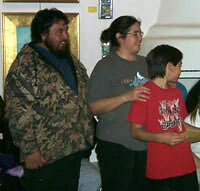 Taos offers a wide selection of artists and varies in cultures. This is seen because of the variety of nationalities that visit and live here. You can walk around Taos Plaza and see people from all over the world looking at the artwork that is displayed. Even some of the artists are from other countries. Taos also has different social classes such as the rich, middle, and lower class. No matter how rich or poor you are you are welcome to be a part of our community. As far as the differences in the world, there are many differences that exist. The world shares many of the same differences as our community does such as people. It offers different types of religions, cultures, social classes, races, leaders, and followers. Some people believe in no God, some in one, and others believe in many Gods. The use of education and value of it differs in the world. There are countries that promote education and others that do not have the financial resources to educate their kids. When a country does not have the resources for education it is seen as unimportant and will suffer from poverty. The use of science and technology varies across countries. One country will use technology to make things easier for their society, while yet another might use it for mass destruction. For example, the United States might use these tools to create an artificial heart to save someone's life. While the country that uses it for mass destruction will use the technology to take control of weak people who have little or no education who are willing to follow who ever will lead. Tolerance means that you are willing to accept other people's beliefs and ways of thinking that differs from your own. Tolerance is important in today's world because there are many differences that can keep us a part if we are not open to what other people think or believe. If we are able to tolerate these differences we won't be fighting or arguing over religions, beliefs or behaviors. In today's world there are a lot of different races interacting with each other on a daily basis. It is important that differences are put aside and accepted in order to be able to work together. Tolerance allows us to grow as a person, a community, and a nation. It is important to recognize and respect different opinions, religions, cultures, and responses that other people have. Differences are important because it helps us grow not only education wise but socially as well. If we weren't different everyone would be doing the same thing and we will not grow as a society. If we do not recognize these differences we will not be able to advance in our financial system and use the tools that are needed to help make it a nicer world to live in. We cannot tolerate harming others, watching others get hurt, or losing faith in what we believe in. For example, when I am mean to my little brother I let him think that I don't care that I hurt his feelings. But when I go to the other room I feet bad. In my conscious I know that I have really hurt him because he looks up to me. No matter how tough I act in front of him I end up feeling bad about allowing myself to be mean to him. When my sister went through her surgery I didn't like to see her in pain. It made me sad and worried because there was nothing I could do to help her or stop the pain. We also cannot tolerate others taking our pride and freedom away from us. When the September 11th incident happened some of us felt that our freedom was taken away from us. Watching how the people were suffering on TV, after the attacks, made me feel scared because that situation can happen anywhere and to anyone. We were afraid to travel because we feared that the hijackers might kill us. The United States financial system changed to help us travel and buy things so that we can continue to grow. Some people even behaved strangely by attacking people that looked like they were from another country. Think globally and act locally, to me, means that when we do something it needs to benefit us all. For example, when we go to the mountain we need to make sure that we do not Pollute the mountain with our garbage. If we take this behavior with us when we are traveling to another city or state we will help have a clean environment. We need to do things in a helpful way that will benefit us all. But if we all work to get our community clean we will all be working at having a cleaner, safer environment. We can build a caring community by helping those that are different then us. For example, there is a kid at school that has to use crutches to walk. During lunch he needs help caring his tray to his table. If someone is hurt or in need of help, whether they are rich or poor, we should help each other with our hearts and not for money or rewards. We can also build a caring community, both locally and globally by accepting the differences in all of us no matter what gender, age, race, or political party we belong to. Once we are able to put these differences aside we can accomplish great things. After all, it is by tolerating differences and working together that has allowed us to travel to the moon.